We arrived on Tuesday after a long travelling day and due to the weather, we almost had to spend an unplanned night in Athens. Being at the airport, ready to board the plane to Athens, it was like being at a convention of volunteers. Although you could see some locals, most of the people getting ready to fly to Mytilini were volunteers. You can very clearly see them: they have big backpacks, sit on the floor, wear waterproof jackets, look fearless and ready to work. We set off to work the next day, still tired but ready to start. There is someone already helping at the location we used to distribute clothes from in October, so we have been given a new location. We are in Kepe, the reception centre for Arabic speaking refugees. That means people from Syria and Iraque. This is already a big improvement, because before, only Syrians were registered here, and on the other part of Moria Camp, all other nationalities. It was very hard to organise translators in both arabic and farsi languages for the other area. This way, instead of being divided by countries, people are divided by languages they speak! It's so much easier this way! Now I can focus on learning one language: arabic. It's also fairly nicer here. There is a courtyard and the huts hide the fences. It's almost bearable. There's trees, an area to walk around and you can see everything that is happening around you clearly. There's even toilets for the refugees to use! This is very different from the place we were working in before! People get to wait in the courtyard until their paper is ready. After they get the paper, refugees can go to the medical clinic or come to us for clothes, before exiting the area and moving on to the next part of the journey, which is getting the ferry to Athens. This is what the inside of our room looks like. There are clothes, shoes, milk powder, hygiene items, diapers, etc. We organise it as well as we can, but it's hard when we receive boxes full of unusable clothes. Here's an example of several items we collected from different boxes!! Costumes. Your intentions may be good, but I would feel nothing but embarrassment if I had to give these to a kid that was soaking wet. It would be like a bad joke. These items went straight to the bin. Here's Jack outside our little "shop". It's a great spot because it's right next to the gate where all refugees exit after getting their papers. It allows us to watch every single person that leaves. We can quickly assess them and see if they need any of the items we have. Here's a "customer" receiving a bag from us. To help us communicate, we have made some helpful papers. On the left you can see drawings of the items we have available. It's much easier when people point than when they try and explain by gestures. It makes things much faster, meaning we can help more people. On the right there are some number in Arabic so people can tell us their shoe size or, for example, the age of their children, so we can give them the correct baby milk. After helping these kids, their dad asked me to take a photo with them. We didn't have much to help them by the time they showed up. We gave them toilet paper, tooth brushes and some socks and they were still very thankful. There's an actual question I got asked a lot when I went back home. "Did you see many terrorists while you were there?" How do I answer to that question? Should I show them photos of the kids I see and say "are these the terrorists you are talking about?" You know when you buy a pair of Toms shoes and it says for every pair you buy they will offer another one to someone in need? 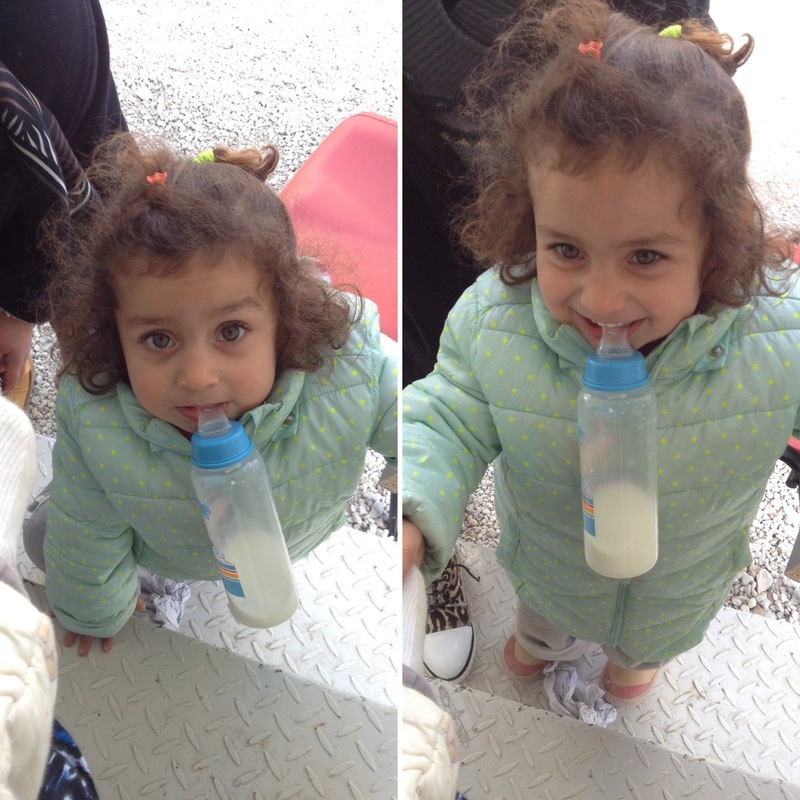 I found those this week :) Toms donated some of their "one for one" shoes to the refugees that arrive to Lesbos! This is a food for thought photo! These shoes belong to a kid that came to us for new dry ones. We gave him some and he left his shoes there. I didn't bin them for ages. I just stared at them and thought about the long journey they had gone through already. In case you con't know what that funky wrapping paper is: it's an emergency blanket. Also known as "emergency everything". In this case, someone made socks out of them, as it was probably the only thing available at the time, after the refugees arrive to the beach in Lesbos. So here we go for week 2! I can't speak for Jack, but I am exhausted. All the mental work about learning a new language and adjusting to a new place is making me extremely tired. I haven't had a normal day yet. Wake up at 8am, go to sleep at 6pm, have a weird night sleep. Hopefully things will improve next week and I will settle into the new routine a bit better. We expect very bad weather! Hopefully no boats will come and we can get on with organising the warehouses. If boats do come... I expect the worse but hope for the best! Internet is very limited now, so expect once a week posts instead.